As soon as I entered the theatre I could feel with every single bone in my body that this play would be amazing and sure enough it was. It was more than just watching a play though - it was an experience. The Suppliant Women by Aeschylus has been adapted by David Greig and was first performed at the Royal Lyceum Edinburgh in 2016. 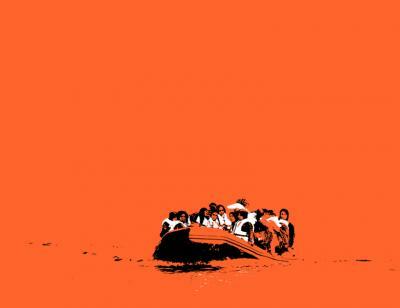 The story is of a chorus of women who have fled from Egypt, where they were to be forced into marriage with their cousins, to Argos in Greece where they seek refuge. Despite being written over 2,500 years ago, the story is resonant with scenes from today. But this production hasn't forced you to think like this by shoving references all over the place. In fact, the only signs of modernity is in the costumes. The story is mainly about, and therefore told by, the chorus - 27 women led brilliantly by Gemma May. They first enter the stage holding branches wrapped in scraps of white cloth - The Suppliant Branches. The chorus are physical throughout the play - from a vibrant, energetic celebration sequence to the most amazing scene where the women tell us the story of Zeus' lover Io, their mother.. There is a huge amount for the chorus to say, and they make the whole production so engaging and alive. It is a common conception that Greek chorus is boring - words recited blandly by a group of people for the whole duration of a play. However, here the story is told in a variety of ways. Beautiful songs created by John Browne, invigorating chanting to the beat of the percussion - anything but boring! My eyes never once left the stage even for a split second, my thoughts never once wandered anywhere, I was so entirely engrossed and involved by the magic that was being created by the chorus. Something that I absolutely loved about this production was how true it stayed true to Ancient Greek Theatre. The chorus in this production has been made up of 27 local women in each of the venues the play has been performed at. In Ancient Greece the chorus would similarly consist of locals (although men not women). There was also a libation ceremony in which wine was poured along the front of the stage. There was even an aulos player (Callum Armstrong) as there would have been when Aeschylus himself put on the play! The entire play was just brilliant and there were constant moments of sheer excellence. It was absolute perfection and I highly suggest you can get your hands on any ticket that you can find. My only issue is that it's run isn't longer - I want to see it again!! !